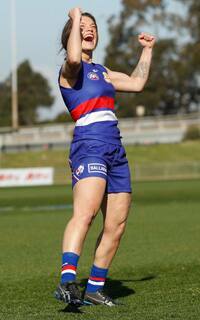 Blackburn: 'It's the best news I've ever had' Meet Western Bulldogs' women's team marquee midfielder Ellie Blackburn and learn about her pathway through football, life away from the football field, and what becoming a Bulldog means to her. Blackburn is a rising star of the women’s game, an elite and fearless inside midfielder with agility and poise. A ball magnet in the AFL Women’s Exhibition Match Series, Blackburn has averaged 20 possessions across four matches for the Melbourne Football Club since being drafted in the 2013 AFL Women’s Draft with pick 13 overall. Renowned for her hard running and skills in close around the stoppages, Blackburn has had a stellar 2016 AFL Women’s Exhibition Series for her former Club Melbourne, as the leading ball possession winner in the Demons’ win over Brisbane, and second only to Daisy Pearce in the March clash against the Bulldogs. Representing Melbourne University in the VFL Women’s competition, Blackburn is a member of the Club’s leadership group and one of the state league’s most influential midfielders. A two time All Australian as a junior, Blackburn represented Victoria at senior level in 2015 against Western Australia, and was among the Big V’s best. Attending Hallam Secondary College, Blackburn represented Victoria four times as a junior, and was captain of the state under 18 team in 2013. In 2011, Blackburn was awarded the Victorian Government’s 2011 Community Sport and Recreation Award, recognised for her athletic excellence and sportsmanship. In life outside of football, Blackburn works as a trainee Store Manager for supermarket chain Aldi.